My arrival in Cluj-Napoca was very bumpy indeed. Literally. The plane bound up and down as it came to an eventual stop on the heavily pot-holed, concerningly rough runway of Cluj-Napoca airport. We were all loaded into buses and transported all of 50 meters to the airport terminal. I guess they have at least some regard for health and safety! After a bit of confusion trying to establish how exactly we were meant to get from the Airport to the Centre we eventually came across a small “Dogbox” down the road with a grumpy Romanian woman inside, whom spoke no english at all. With some pointing and hand gestures we managed to get bus tickets. The bus trip from the Airport was a real eye opener, I had not seen so many ruined buildings and shantytowns in my life. Finally, I think, I’m in eastern Europe. Proper. Eventually we got off the bus at a run-down public square. It was quite a sight: Walls broken, cobblestones missing, weeds everywhere, rubbish on the ground. Wow. The first thing we did was made our way to the main railway station as we were due to catch a train to Brasov that evening. When we got to the station we discovered that we had just missed a train, leaving us with an hour to kill. 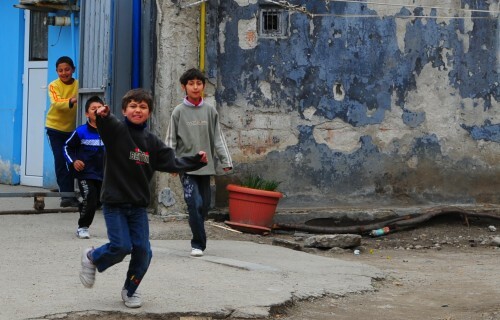 We wandered down the road and found some slum like housing with children playing in piles of rubble. I couldn’t help but whip out my camera and snap a picture, as I had never seen anything like it before. Within seconds the kids had noticed me and were throwing stones my way in anger. Ooops! better get out of here! We strolled down the road a bit more and found a playground with 3 kids kicking a ball around. As we approached the ball flew out over the fence and onto the road. I thought I’d be nice and kick it back in. Mistake #2 of the day: Don’t kick balls while wearing two huge packs. The ball didn’t make it back into the park, Instead it bounced off the fence, back onto the road and was immediately run over by a passing car, bursting the ball. I immediately panicked! I just destroyed their ball. I felt absolutely awful as I saw them come onto the road to collect its carcass, staring at it in disbelief and making gestures suggesting they thought there may be some way to repair it. My friend Stuart made the suggestion that I should give them some money for it. Somehow that blunderingly obvious solution to this poignant situation had not crossed my mind. I handed the kids 20 LEI (£6) for their ball and left. Whew. That was that largely solved. With the kind of prices we saw in Cluj, 20 LEI would have bought them several new balls and let them live like kings for a day so that definitely should have covered it! Eventually we boarded the train for a 6-hour ride to Brasov. Looking out the window along the way was interesting. I saw a lot of small villages and shantytowns without a single car in sight, or even provision for cars. They had no streets, driveways or garages for cars either. There also did not appear to be any electricity or telephone lines wired to any of these places. They seemed to be surrounded by crop fields and were seen moving goods around on horse carts. I was surprised to be seeing this kind of living in an EEA member state! Amish (like) people perhaps? The entire world could go into financial meltdown and these guys would hardly even notice. 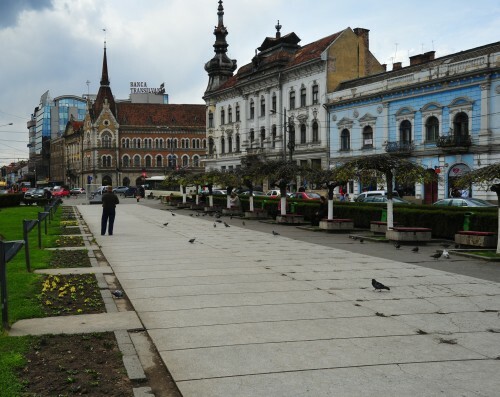 Filed under Cluj-Napoca, Romania, Travel.